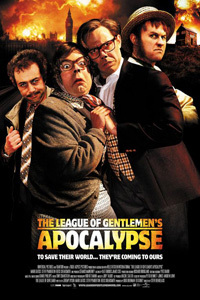 The fictional world of Royston Vasey is facing apocalypse and the only way to avert disaster is for our nightmarish cast of characters to find a way into the real world and confront their creators. From present day Soho to the fictional film world of 17th Century Britain, the residents must overcome countless bizarre obstacles in their bid to return Royston Vasey to safety. In addition to featuring the most beloved characters from the original TV series, this darkly hilarious movie adventure also features a whole host of freakish new creations.